Earlier this week, scientists from the Evolutionary Studies Institute of Witwatersrand University (Johannesburg) put on display the fragmentary fossils of a huge dinosaur which roamed South Africa. The fossils date from the Early Jurassic and represent an plant-eating dinosaur, a Sauropod that measured perhaps in excess of sixteen metres. There have been a number of remarkable fossil finds over the last two years or so in South Africa. These discoveries have helped to shed new light onto the fauna and flora of the Late Triassic and the Early Jurassic geological periods. The announcement of the latest dinosaur discovery the “Highland Giant” coincided with the celebration of UNESCO’s World Science Day for Peace and Development. A special poster has been commissioned to celebrate South African dinosaurs and other prehistoric life. This poster was designed by artist and poet Maggie Newman. The prehistoric life of South Africa. The beautiful and very detailed poster depicts South Africa some 200 million years ago (Hettangian faunal stage of the Early Jurassic), a time when the continents were formed into a super-sized landmass that was beginning to split apart. Dinosaurs were becoming the dominant terrestrial fauna but they shared the land with a wide range of other bizarre reptiles as well as some synapsids that were from the branch of the Tetrapoda that would lead to modern mammals. 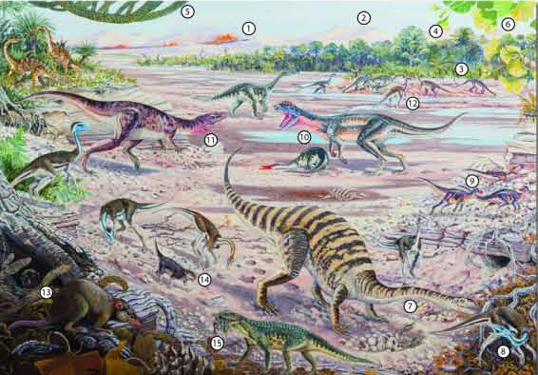 This poster shows a scene in South Africa between 200 and 183 million years ago. At the time the continents were splitting apart and there were many volcanic eruptions (1). The climate was drying and there were sand dunes (2), tree ferns (3), yellowood (4), monkey puzzle (5) and ginkgo trees (6) formed patches of forest. Early dinosaurs like this egg-laying Massospondylus (7) are shown fending off a hungry Coelophysis (8). Heterodontosaurus (9) was different from other dinosaurs because it had incisor, canine and molar type teeth for cutting, biting and grinding up their plant food. The name Heterodontosaurus means “different types of teeth” and this interesting small animal may have had quills like a porcupine. In the scene, three Heterodontosaurus are fleeing a kill made by a crested dinosaur called Dracovenator (10), a relative of Dilophosaurus. The Dracovenator is being threatened by a Ceratosaur (11). The herbivorous Aardonyx dinosaurs (12) in the background are foraging peacefully. Dinosaurs were not the only animals alive at this time. Megazostrodon (13) was a small insect eating animal closely related to the earliest mammals. Tritylodon (14) was a mammal ancestor with teeth like a dassie (Rock Hyrax – Procavia capensis). The animal that looks like a lizard (15) is a small armoured land-dwelling crocodile called Protosuchus. The original fossils of the dinosaurs and other prehistoric animals depicted in the poster are on display at institutions and museums around South Africa. Everything Dinosaur would like to take this opportunity to thank those institutions involved with the commissioning of the poster, helping to inform and to educate people about life in the past.